Does dyeing your hair with Nutella actually work? We should just start a new column series titled “Can ≠ Should”. 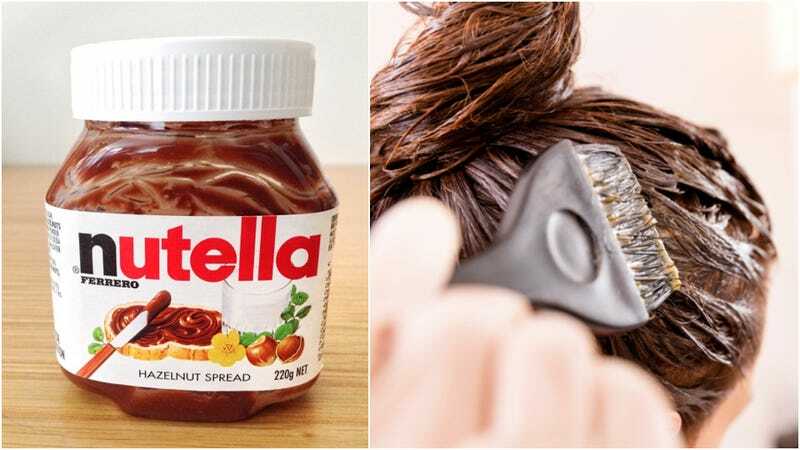 Alongside such ideas as the spaghetti burrito and cooking fish in a dishwasher comes the latest in appetizing hair trends: dying your hair with Nutella. Marie-Claire and Cosmopolitan reported on this strange practice a few weeks ago, as M-C noted, “At Abed & Samer salon in the United Arab Emirates, the chocolate-infused hazelnut spread is being repurposed by colorists to take women from blonde to brunette.” The practice includes not only Nutella, but sweetened condensed milk poured over the Nutella-ed strands. Well, it probably smells a whole lot better than hair dye usually does. Marie-Claire reports that the chocolatey result doesn’t last super-long, but the palm oil in the Nutella also basically acts as a mask for your hair. This led some YouTube beauty gurus to try out the trend, and so far, the Nutella did not seem to have any darkening effect on the blonde bloggers we’ve witnessed. Maybe because they lacked the all-important condensed-milk step as a binding agent? They do agree that it made their hair softer and shiner though. But you could also accomplish the same thing with coconut oil with a lot less mess—so really it makes more sense to just eat the Nutella.